"Pikes Place Market Gets Ready for Bed"
During the day Pikes Place Market is noisy and full of hustle and bustle as the vendors are selling to their customers freshly caught fish, newly cut flowers, and other market goods. The scene completely changes just before sunset as the area transforms into a quiescent vacant market and nearly abandoned streets. This photograph was taken about the time of the day when the market is silenced and the beautiful red glow from the sun shows against the water. This picture is somewhat of an illusion. 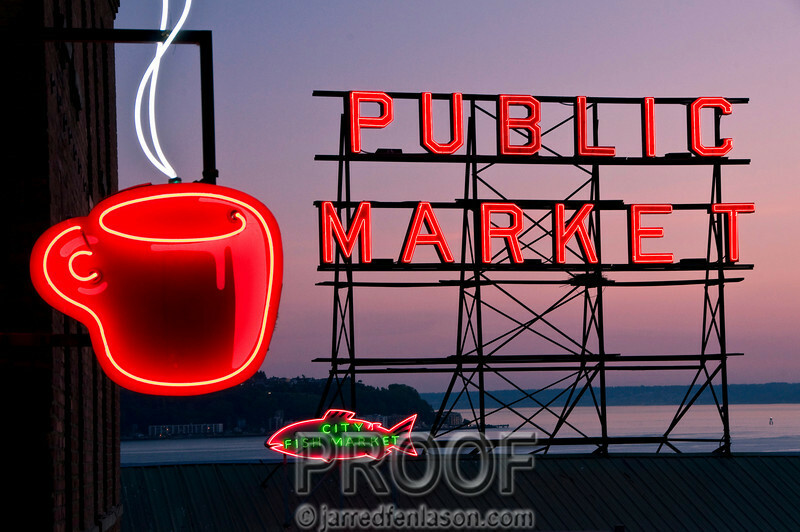 The coffee cup is actually a neon sign from a local coffee shop up the adjacent street and is approximately 200 feet uphill from the Public Market sign. To get both in clear focus I chose an aperture of f/19 and a slower shutter speed of 1/3 second. It's critical to get the camera set up in anticipation of the shot as the colors this time of day typically fade away after just a few minutes.